The cupcakes that filled the upstairs room at the Brooklyn Winery Tuesday night, Dec. 7, were not regular cupcakes. No plain chocolate or vanilla in sight. These were the royalty of all cupcakes. The people that gathered there were not regular people— they were cupcake-frosting-sprinkley-crazed people. 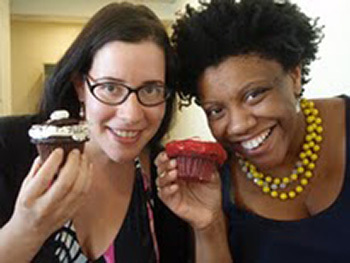 And they were there to celebrate the queens of their obsession, Rachel Kramer Bussel and Nichelle Stephens, and the sixth anniversary of their über-popular cupcake blog, Cupcakes Take The Cake. This is a moment Bussel and Stephens, who are not professional bakers, but “professional eaters” as they put it, never imagined would happen when they took their love for baking, photographing and eating the sweet treat to the Internet in 2004. Each day, Bussel and Stephens along with their five contributing bloggers update the blog with photos, recipes and reviews of new cupcake bakeries. Their dedication to their craft has garnered them a loyal following of more than 2,600 Facebook fans and over half a million visitors to their blog each month. Stephens, who has started several blogs in the past, says she never thought the cupcake blog would get this big. As Cupcakes Take the Cake continues to grow in popularity and Bussel and Stephens personal fame grows, they’ve been featured on “The Today Show” and “Martha Stewart” to talk about cupcakes, they’re still amazed at the blog’s success. And at the dedication of their readers. Although the country’s unemployment rate is still high and the recession wages on, consumers didn’t let that stop them from shopping ‘til they dropped over Black Friday weekend. According to stats released by the National Retail Federation, the world’s largest retail trade association, more than 212 million shoppers hit stores and websites over Black Friday weekend, Nov. 25-27, spending a total of $45 billion. On average, shoppers spent $365.34 this weekend, up from $343.31 last year; a 6.4 percent increase. Shoppers came out in full force early to get some of the year’s best deals. Some started the shop-a-thon on Thanksgiving Day and one Florida family set-up camp outside a Best Buy nine days before Black Friday. 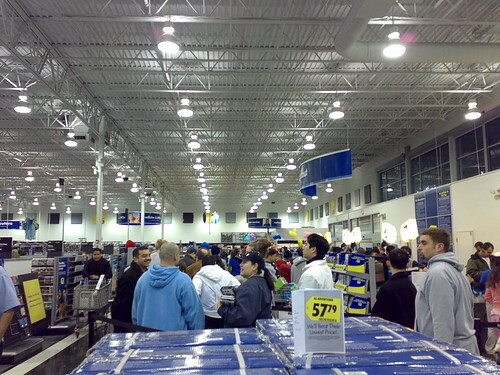 This is all great news for retailers as holiday shopping gets into full swing. Skyline Mix by Lasswell is licensed under a Attribution Noncommercial (3.0). 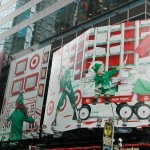 Target displays its holiday 2010 billboard. 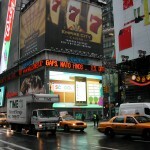 Various billboards in Times Square. 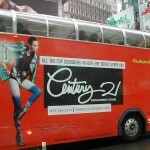 Century 21 ad on the side of a double-decker bus rolling through Times Square. 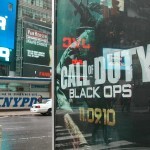 Call of Duty: Black Ops ad displayed on the side of a phone booth. 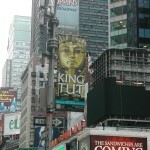 King Tut hanging banner ad. Window display at the Times Square Billabong store. Adam’s point is one shared by many frustrated cell phone owners. J.D. Power and Associates recently released a study that found increased incidences of dropped calls are causing people to switch cell phone providers. Although cell phone companies like AT&T, Sprint, Verizon and T-Mobile boast about their extensive coverage area, how good are they really? Are customers who currently subscribe to their services happy? Do they plan on switching to another provider? The majority of the people I surveyed seemed somewhat satisfied with their cell phone providers, although they have considered ditching their current provider for a new one. Also both Verizon and non-Verizon customers said the wireless company had the best coverage area. Posted in Survey | Comments Off on Can You Hear Me Now? The resources for seniors in Gowanus, a community in Brooklyn, are dwindling. The number of places they can turn to for assistance with housing, healthcare and basic necessities such as food, are declining. Already this year, one senior center and two health clinics have closed. Seniors are slowly becoming yet another causality of the economic recession. But for seniors in need living in Gowanus, there is a ray of hope⎯ Blanca Morocho-Ramirez, coordinator of the Raices Wyckoff Senior Center. Morocho-Ramirez is operating the center, which feeds hundreds of seniors a week and provides them with recreational and educational activities, on a shoestring budget and a small staff. In a single day, she could serve as the counselor, secretary, bookkeeper, and activities coordinator. She does whatever is necessary to keep the center afloat. For Morocho-Ramirez, being the head of the senior center is more than a job. It’s a way for her to help those who are most in need. She sympathizes with the economic struggles that her seniors go through, and she lets them know on a consistent basis that she is there for them. But, she says helping them is not a simple task. The City’s budget cuts have put tight restrains on the number of seniors the center can feed each day⎯ a maximum of 40 for breakfast and 65 for lunch. With so many seniors in need, she says it is tough and any help people could give would be greatly appreciated. Kids are adorable, there’s no denying that. Just check out this trailer from the movie “Babies” for proof. But, and this is a big BUT, they can also be annoying and crazy as hell. Just look at this viral video of a two-year-old chain smoking. Now that’s crazy. Tip #1: Tune them out. One of the best tricks for dealing with a terrible child is to ignore them. Just put on your iPod, close your eyes and pretend you’re on a tropical island somewhere. If your iPod earpiece isn’t enough to drown out their high-pitched squeals, try these earphones from Dr. Dre. Tip #2: Stare the parents down. This tip can be a little awkward, but if the parents aren’t doing anything to quite their child, stare at them and sigh loudly. Hopefully this will cause them to do something to get their kid to quite down. On the flip side, they could get pissed and want to fight you. If that’s the case, be prepared by taking boxing classes at Trinity Boxing Club in Manhattan. Tip#3: Be Patience. Just try to be patient. Children tend to act out because they’re frustrated, angry or just tired. WebMD says kids throw temper tantrums because they don’t know how to express themselves. So just relax, they’re not you’re children and you don’t have to take them home. Love is in the air everywhere in New York City. Public displays of affection (PDA) are seen from the young and the old at street corners, coffee shops, five-star restaurants…everywhere. It’s actually really sweet and just another sign that New York is becoming a friendlier city. However, when those acts of PDA are elevated from cute pecks on the cheek and simple hand-holding to all out slobfests, especially in confined spaces such as on the subway, it can be a bit of a problem. CUNY Interactive Journalism is proudly powered by WordPress MU running on Craig Newmark Graduate School of Journalism at the City University of New York.